To the Rosenbach for a talk about Wilde, Whitman, and Mickle Street. 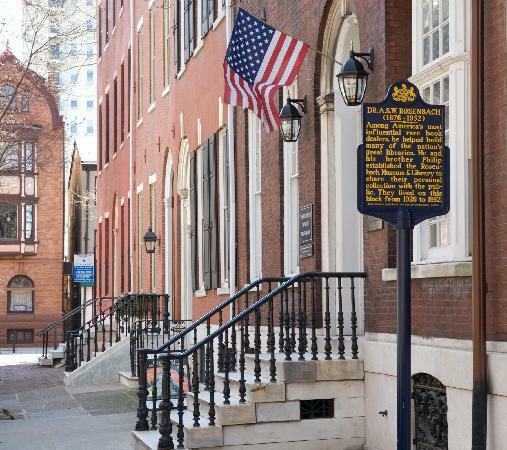 Last Wednesday evening at the Rosenbach Museum and Library I attended a talk about Mickle Street, the new play that showcases the 1882 meeting between Walt Whitman and Oscar Wilde. One of the presenters was the author of the play Michael Whistler, who explained how it had been necessary for him to invent conversations and situations to portray events that had not been fully recorded. All well and good: reimagining is a legitimate technique in storytelling. But it naturally raises the question of realism vs. artistic license. This bold assertion halted my thought process as it appeared to transcend any idea of boundaries: there was an air of mutual exclusivity about it. Granted we were in a library, but I sensed a virtual divide had suddenly been placed between fact and fiction. As if facts ought to be the sphere of the scholar and fiction the preserve of the playwright. I wondered was the speaker still in the realm of explanation or was this now justification? And then I realized: it was both! An author defending himself simply by defining himself. Quite deft, I thought. However, as I am not a playwright myself but rather something of a scholar, I soon realized this construction placed me on the other side of the argument. So the question: how much of the debt to history is owed the critic and how much by the artist?